If you’re old enough to remember Cathode Ray Tube (CRT) Televisions, you probably remember that Sony sold the top products. Their Trinitron tubes always made the best TVs and Computer Monitors. [Alec Watson] dives into the history of the Sony Trinitron tube. Sony Color TVs didn’t start with Trinitron — for several years, Sony sold Chromatron tubes. Chromatron tubes used individually charged wires placed just behind the phosphor screen. The tubes worked, but they were expensive and didn’t offer any advantage over common shadow mask tubes. It was clear the company had to innovate, and thanks to some creative engineering, the Trinitron was born. 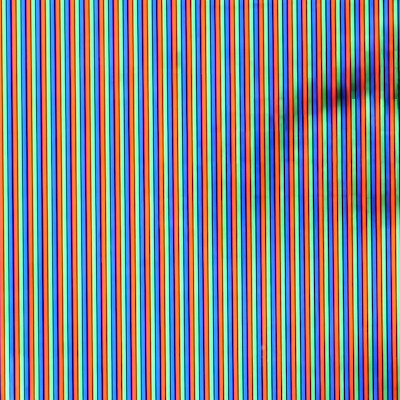 Closeup of a Trinitron tube shows unbroken vertical stripes which led to a brighter picture. All color TV’s shoot three electron guns at a phosphor screen. Typical color TVs use a shadow mask — a metal sheet with tiny holes cut out. The holes ensure that the electron guns hit only the red, green and blue dots of phosphor. Trinitrons use vertical bars of single phosphor color and a picket fence like aperture grille. The aperture grill blocks less of the electron beam than a shadow mask, which results in a much brighter image. Trinitrons also use a single electron gun, with three separate cathodes. [Alec] is doing some amazing work describing early TV systems and retro consumer electronics over on his YouTube channel, Technology Connections. We’ve added him to our Must watch subscription list. Interested in retro CRTs? Check out Dan’s article on cleaning up the fogged plastic safety screen on the front of many CRTs. There’s some debate on which program gets the infamous title of “First Computer Virus”. There were a few for MS-DOS machines in the 80s and even one that spread through ARPANET in the 70s. Even John von Neumann theorized that programs might one day self-replicate. To compile all of these early examples of malware, and possibly settle this question once and for all, [Mikko Hypponen] has started collecting many of the early malware programs into a Museum of Malware. While unlucky (or careless) users today are confronted with entire hard drive encryption viruses (or worse), a lot of the early viruses were relatively harmless. Examples include Brain which spread via floppy disk, the experimental ARPANET virus, or Elk Cloner which, despite many geniuses falsely claiming that Apples are immune to viruses, infected Mac computers of the 80s. [Mikko] has collected many more from this era that can be downloaded or demonstrated in a browser. Retrocomputing is an active community, with users keeping gear of this era up and running despite it being 30+ years old. This software, while malicious at the time, is a great look into what the personal computing world was like in its infancy. And don’t forget, if you have a beige computer from a bygone era, you can always load up our Retro Page. Thanks to [chad] for the tip!